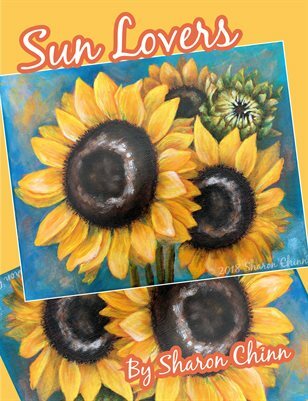 Bouquet of sunflowers painted on your choice of 8″x10″ or 16″x20″ canvas or other surface. This design is inspired by photos I took of a sunflower bouquet I purchased from the local farmers’ market a few weeks ago. I worked hard to capture the vibrant color in the flower petals. The design is painted with DecoArt Americana Premium Acrylics with conversion to regular Americana acrylics. Pattern is 16 pages and includes supply list, step-by-step instructions, 28 illustrations illustrations and 2 sizes of drawings to trace.